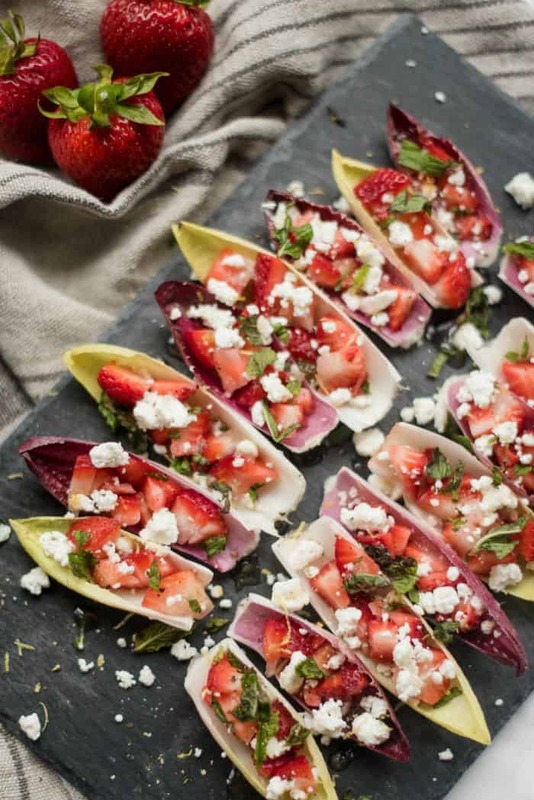 Enjoy this simple Endive with Strawberry Mint Honey Recipe for easy entertaining. 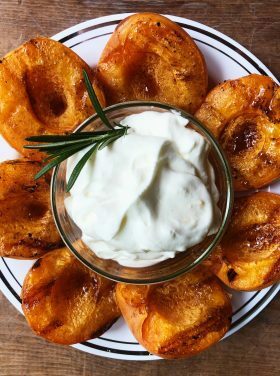 A gluten-free, fresh seasonal appetizer for any party! 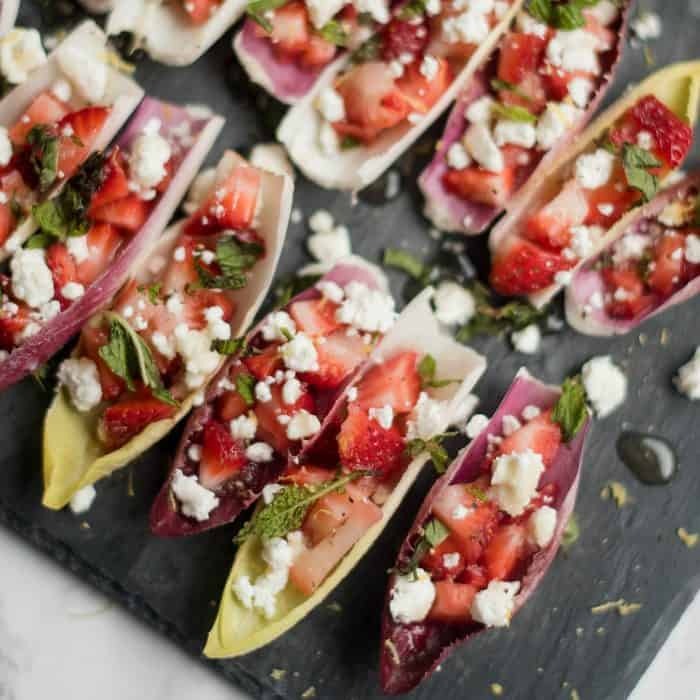 Friends, for a delicious weekend appetizer, try this Endive with Strawberry, Mint, and Honey Recipe (great for the gluten-free crowd, too!). 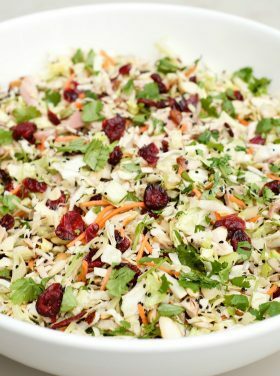 If you’re an endive lover like I am (come on, it’s one of the easiest ways to prepare an appetizer, and you may like my favorite Pear Cranberry Endive Appetizer or Apple Endive Appetizer!) 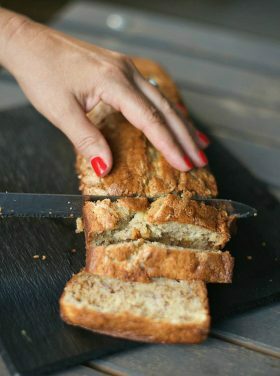 then this recipe is for YOU today! Endive is sometimes called chicory, or in French it’s chicorée frisée. I love to pick up a 3-pack at Trader Joe’s but you can buy it almost anywhere. 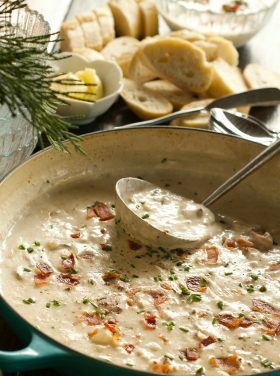 Just break off the leaves for the perfect appetizer bite. Of course, stuff them with your favorite ingredients. Honey is always delicious drizzled on top! If you want a few words of inspiration I’ve shared a little bit over at Simple Mom’s about encouragement and hospitality! I love to encourage others to be hospitable. Because we all know that hospitality is what makes the world go around. 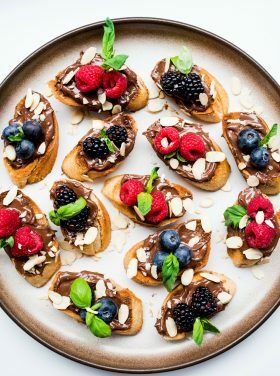 People all over the world practice hospitality and it has to do with connecting and feeling loved. Feeling welcome and encouraged! 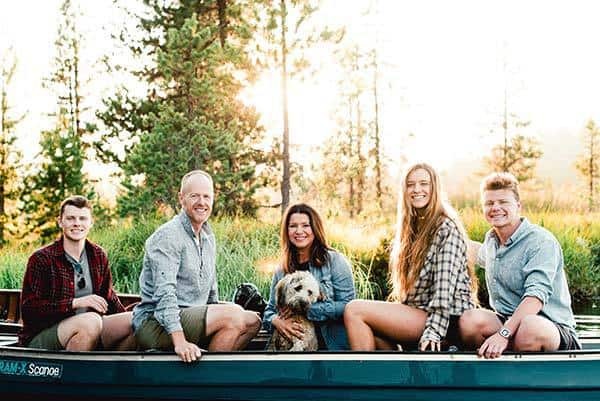 I think about the last time we’ve opened our homes, inviting friends, family, neighbors, single friends, new friends, friends that want to connect with others, older and younger friends – all types of friends, in for a meal. For some of us, it’s been a long time. We love to come together out by the fire over some tasty wine and an array of healthy appetizers before dinner. Or, skip the dinner and just enjoy appetizers! 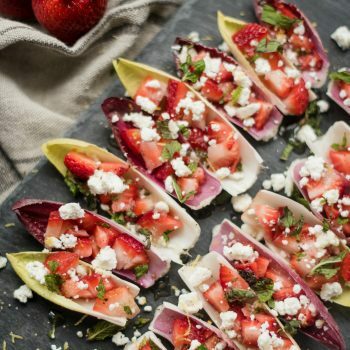 You can’t go wrong with a yummy endive nosh. 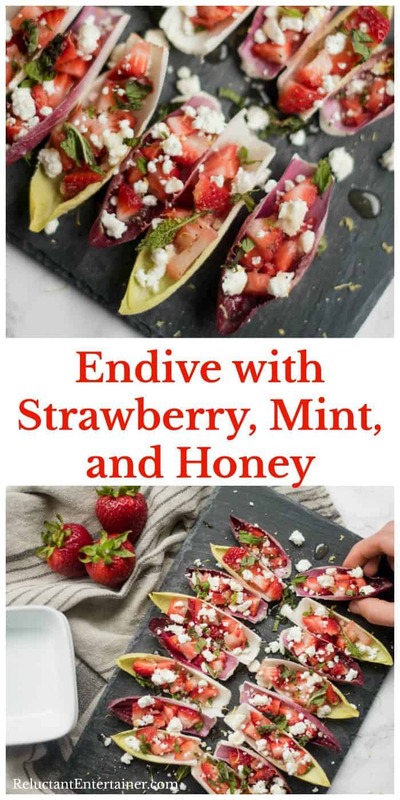 I have a few recipes on my blog like Stuffed Endive with Walnuts and Honey or Black Bean Salad Stuffed Endive (fun for a Mexican feast) or BLT Endive Bites [Real Housemoms] or Smokey Almond Cream Cheese Endive Bites [The Food Charlatan]. Make dairy-free by leaving off the goat cheese. 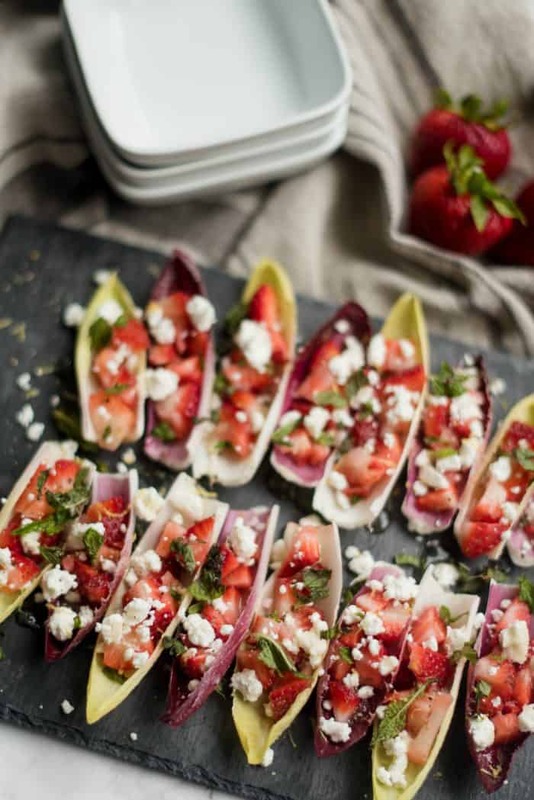 Lay the ribs of endive on a platter and sprinkle strawberry pieces inside. On top, sprinkle crumbled goat cheese and mint. Drizzle with honey and sprinkle on lemon zest and honey. 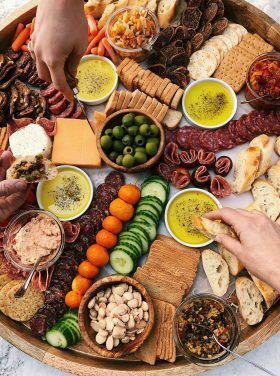 Pretty appetizer for a party! These look so fresh and perfect for summer! I love a pretty appetizer that’s also healthy! Love it. Gorgeous appetizer. We are finally picking strawberries just this week, and I can’t wait to try this. Yum Sandy! 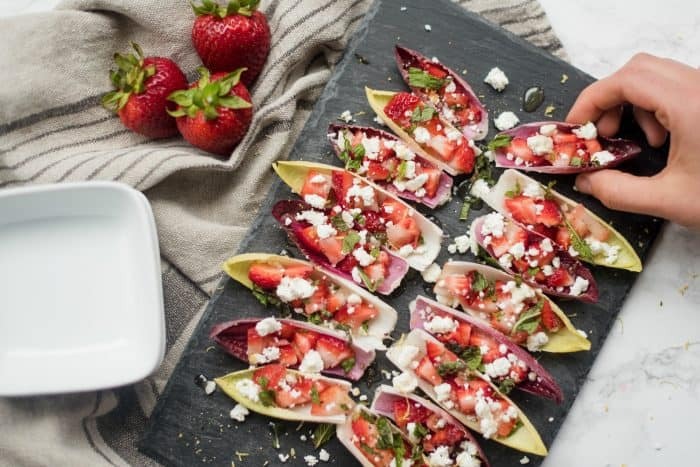 I love strawberries prepared in a savory way. So gorgeous Sandy! 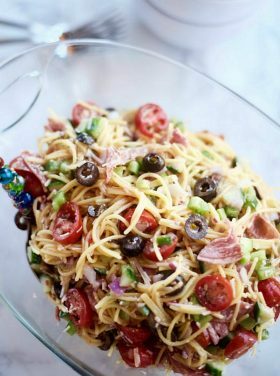 I would love to try this, such a great summer meal! I love the vibrant fresh colors and flavors in this, gorgeous! These are gorgeous, Sandy! I especially love the red endive. I love this idea, it’s perfect for summertime. Have a great day Sandy…looking forward to hanging out ! !